Storm King’s Barrows: Tombs and Crypts of the North is a DM’s Guild product with ten dungeons in the northern Sword Coast area. This is the second in a five part series of reviews. I will cover Grotto of the Death Giant by Eddie Gioffre and Saving Barbadoo’s Mine by Matt Butler in this review. Each dungeon will receive it’s own standalone rating and I will also give an overall rating for the entire Storm King’s Barrows product upon completing the series. First things first. This review is of version 1.3 of the product so if there are any inconsistencies between any factual comments I make regarding Storm King’s Barrows and what you believe to be accurate, please ensure you are referencing the same version I am. Otherwise, please feel free to contact me! 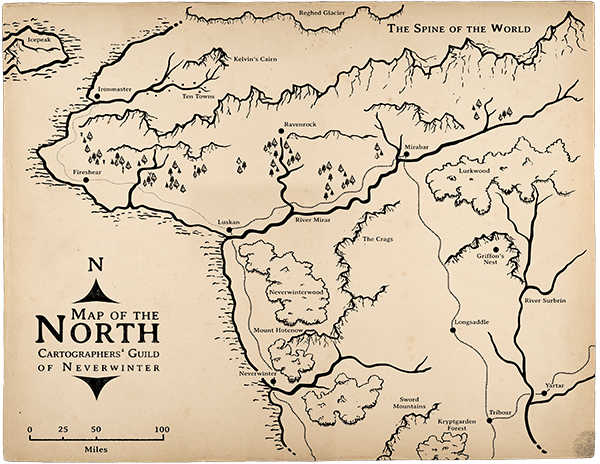 Additionally, this product comes with high-resolution maps for each adventure (.png format) as well as a Map of the North. All of these maps are also at the end of their respective adventures. And, finally, there is an ink-friendly version which you will want to take advantage of if you plan to print any of these adventures on your home printer as the background for the high-res PDF is sure to be an ink hog. A long-forgotten cult is showing signs of activity once again. Scarified humanoids are raiding trade routes in the north. Their scarification is self-imposed and is done in the name of Karontor. Once beautiful, Karontor’s greed and jealousy deformed him. Now the followers of the god of self-loathing and hatred pay their respects and show fealty by deforming themselves. Ogres and goblins have teemed up with a firbolg, Gompf, and their raiding threatens not only giant society but also the neighboring human settlements. Gompf’s mission is to free the Black Heart of Karontor. Long ago, clerics could not dispel this black onyx of its infused power so they encased it in a magical cage in what has effectively become Karontor’s tomb. Once freed, Gompf and Karontor plan to create an enormous army and wreak havoc on all who are in the way. Originality is a tricky category. Christopher Booker argued that there are only Seven Basic Plots and while I haven’t studied it enough to weigh in with a personal opinion I tend to think he’s on to something. So when I rate originality I’m actually looking for something that is compelling and convincing. These are subjective and relative to one’s experience. The same for uniqueness. So, while Eddie Gioffre didn’t create Karontor I do think he’s done well at reinvigorating an obscure lesser deity of the Realms. He gives compelling reasons for why the magical cage has been weakening over the ages and the consequences of that weakening. I particularly liked the Mushroom Hunter adventure hook. Without that magical cage’s weakening, the Mushroom Hunter hook simply would not work! Gioffre’s writing style is easy to read. There is the minor spelling or grammar mistake here and there but not much that forced me to go back and reread a passage for clarity. For example, when describing “Travelers in the Area” on page 43 he mentions “A Suspicions Pair” when he means “A Suspicious Pair”. Then there is an occasional unnecessary comma in some sentences. I didn’t feel that any of these minor mistakes were frequent enough to merit losing a star. This is solidly written material! Great format and quality maps just as with all the entries in Storm King’s Barrows. I’ve already addressed the compelling/convincing part of this adventure. The motivating factors for a good adventure are well-established. The narrative is good too. I would have loved a bit more character development with Gompf. Does he have deeper motivations for revitalizing this cult? What is his leadership style? Is he a reluctant participant in this scheme? Does he have plans of betrayal even towards Karontor or is he a garden-variety boot-licking sycophant? Gioffre makes good use of the 5E mechanics and the encounter density feels ideal for this adventure’s stated optimization of 5 PCs. Storm King’s Barrows costs $14.95. It may seem prudent to take that price and divide by 10 to calculate the appropriate cost per adventure. However, I believe a more useful means is to go by page count. Grotto of the Death Giant is 13 pages long. So this adventure has an allocated cost of $1.45. This is a great price for a good adventure. Citizens of Neverwinter are concerned that Mount Hotenow will erupt soon. They can see the smoke rising and where there is smoke there is fire, right? In actuality, a fire giant has kidnapped a rival cloud giant named Barbadoo. The aforementioned fire is from Barbadoo’s burning cottage on the side of Mount Hotenow. The fire giant, Kragnor, and his minions attacked Barbadoo while the cloud giant to gain control of his brightsteel mine. Brightsteel is similar to silver yet as strong as steel. However, it is much denser so any weapon or armor forged from the ore is much heavier. Weapons deal additional damage and the mystical properties of the metal means it can glow as a torch would for half an hour a day. It is expensive to mine and tricky to work with, thus it is incredibly expensive. It’s a lucrative business. As someone interested in finance and economics I appreciate this adventure’s use of a raw material to set the stage. I like that brightsteel is heavy and capable of providing mystical glowing properties. I did find myself thinking a lot about Red Steel when I was reading Saving Barbadoo’s Mine. In that campaign setting the red steel was lighter and deadlier. But that setting focused on consequences too. I’m missing that in Saving Barbadoo’s Mine. We can infer that heavier armor and weapons may mean more encumbrance. But does armor made with brightsteel offer any additional AC bonus? Disadvantage on stealth? We don’t know. The author doesn’t tell us. Several citizens of Neverwinter have reported seeing smoke rising from the side of Mount Hotenowand are concerned it might be on the verge of erupting again. Again, it’s minor. But it’s consequential if you have to reread passages to understand them. Of course, if you are already familiar with Mount Hotenow then this is less problematic. You probably picked up on the missing space between the words right away. The writing can also be a little tedious with the descriptive text so you’ll want to slow down and read this one a little more carefully. That being said, any grammar detractors are more than made up for by Butler’s humor. He makes great use of humor without descending into giddy silliness or taking away from the gravity of the story. Given that Saving Barbadoo’s Mine is part of a collection and edited by the same person, its production quality is on par with the rest of the entries. That is to say it is formatted nicely and of a top quality. I withhold a star only because of lack of inline maps. The maps that are included at the adventure’s end as well as externally as high-resolution graphics are great though! So don’t let this dissuade you from looking into this. Traps, descriptive locations, developed NPCs and monsters, and a wide gamut of skills checks make for a thorough design that will appeal to PCs whether they prefer combat more than role-playing or vice versa. The treasure rewards and experience points gained are inspired as well. This a fun adventure that doesn’t lose sight of its focus. And I absolutely love all the pop culture references Matt Butler makes in this adventure! Saving Barbadoo’s Mine is 9 pages long. So this adventure has an allocated cost of roughly $1.00. This is practically a steal! In fact, the only way I’d give anything 5 stars is if it were free or pay what you want.